I was sent two Snack Taxi's to review. 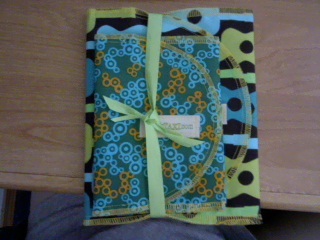 One large in guitar print, and the second one small in blue and orange circular print. I love that they shipped them in a cute little bow! ♥ If you are like me you are constantly using sandwich baggies which get expensive and is bad for the earth. Good Bye Baggies! Hello Snack Taxi! 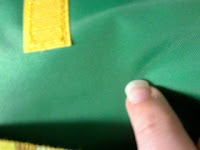 Inside the Snack Taxi's is a green vinal fabric. Which is great for easy clean up, and that means no mildew. Ick! The snack taxi's are gre for on the go, school, or long road trips because they are super durable. 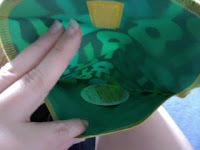 you can easily stick two sandwiches or a sandwich and chips or ect..Into the large bag. and fruits, veggies, and ect into the smaller bag. They are easy to trasnsport and your children will love the bold designs and prints. Even your husband. ♥ I receive no monetary compensation for this review. I was provided a tSnackTaxi to try and give my honest opinion.